A lesson in materials handling decision-making. Finding the perfect fit. When it comes to replacing your forklift truck fleet, finding the best solution means being open to the advice of a supplier you can trust – and being very clear on what you want the lift trucks and the dealer to do. Mark Nicholson discovers how one major provider of products and services to the industrial and construction sectors got it right. When the materials handling contract for Harsco Infrastructure UK last became due for renewal, the company initiated a competitive tender process which would see its fleet of more than 40 diesel forklift trucks completely replaced. Since signing the contract and taking delivery of its new fleet, Harsco Infrastructure has changed its name. Following an international merger deal it is now a division of Brand Energy, which services the global energy, industrial and infrastructure markets, and is known as Brand Energy and Infrastructure Services UK. 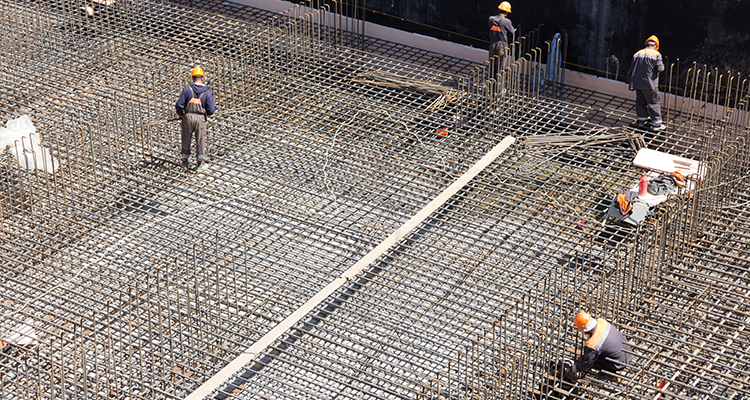 The company’s specialisms include scaffolding, mechanical access equipment, construction formwork, shoring materials and industrial maintenance services. 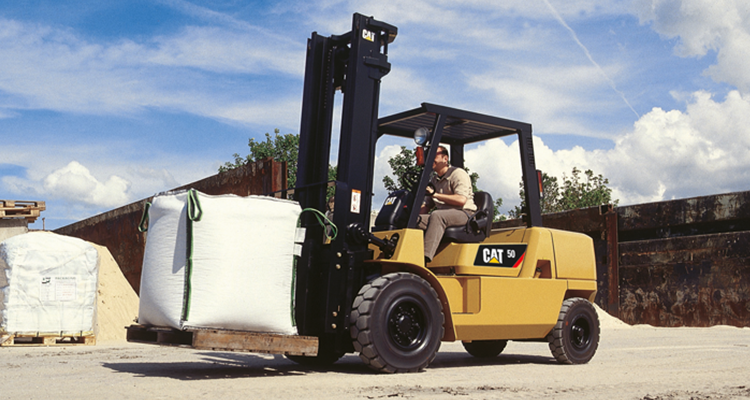 To meet the materials handling needs of its 11 depots, stretching from Southampton to Edinburgh, it has turned to Cat® Lift Trucks for 40 new DP30N 3 tonne diesel counterbalance trucks and three DP50N 5 tonne diesel models. 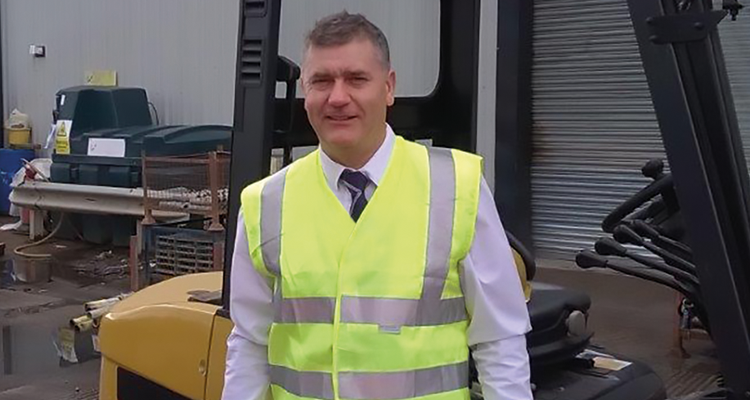 Paul Grady, Major Account Manager, Impact Handling. For Harsco Procurement Manager Ian Sheppard, one of the first steps in the decision-making process was to draw up a detailed specification of the company’s forklift truck requirements, in terms of capabilities and qualities, and check that the suppliers’ detailed specifications met every need. The forklift trucks needed to be strong and durable enough to lift large, heavy items in an intensive application that involved around 1,000 hours of work per year in warehouse sites of up to three acres in size. 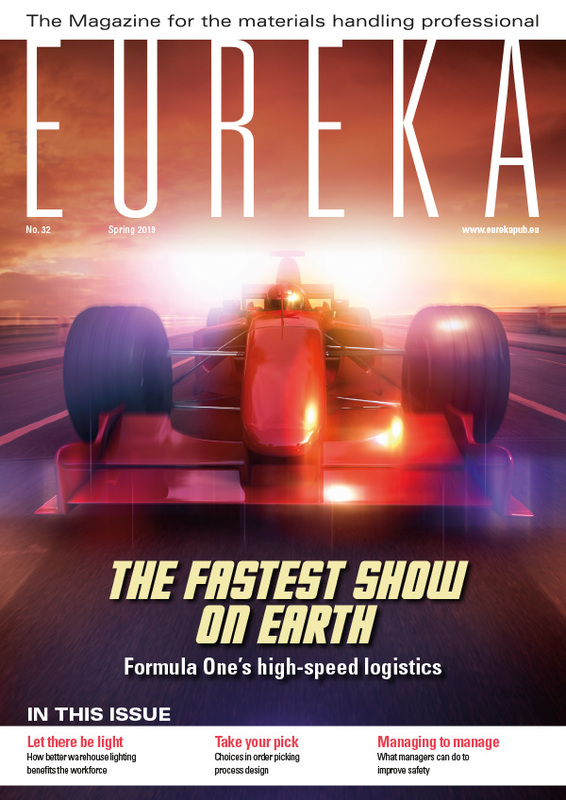 “We looked very closely to ensure that the forklift trucks proposed addressed concerns such as stability, reliability and resistance to damage." 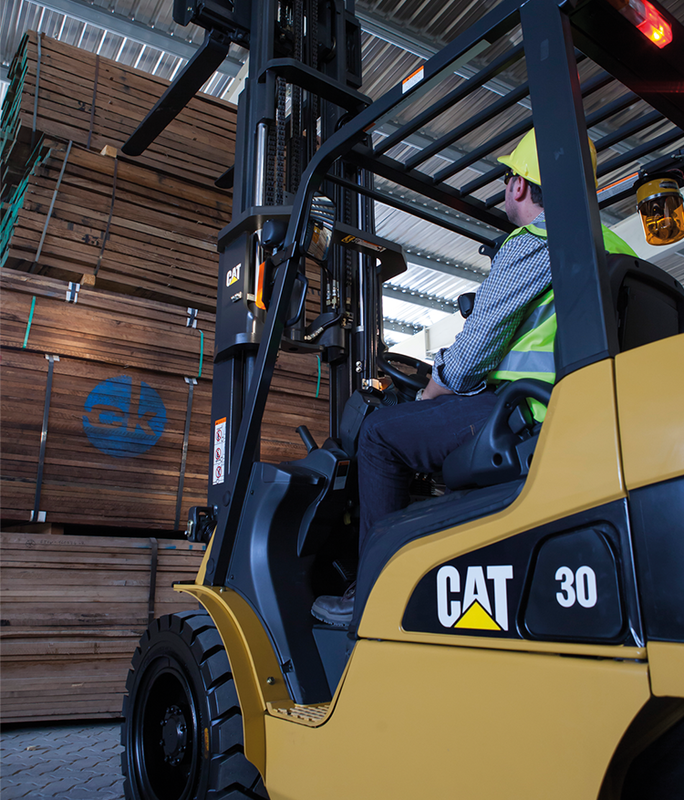 Although the company does have one 3 tonne electric Cat lift truck, and recognises that electric and LPG powered forklift trucks have much to offer, it feels that its needs are best met by diesel power. “The trucks have shown a higher residual lifting capacity than their equivalent competitors and have given us added stability." The diesel engines of the forklift truck models selected have been optimised to reduce emissions, and Harsco is happy for them to work inside its sheds as well as outside. The buildings are large and well ventilated, with roller shutter doors remaining open throughout working hours, and are unheated. To prevent damage from dust in the sheds, the trucks are fitted with enhanced filters. As well as lowering emissions, the latest diesel engines maximise fuel economy. To reduce consumption further, Harsco encourages drivers not to leave the trucks idling – and in fact they are programmed to cut out automatically if left to stand with the engine running. Working in a wide variety of environments, and often faced with sloping or slippery surfaces, Harsco’s forklift trucks need to deliver high levels of traction. Maximum lift heights are usually no more than 4,000 mm, but residual capacity is very important – particularly when handling items with a large load centre, such as scaffolding. In this respect, Ian Sheppard and his colleagues have been particularly pleased with the new fleet’s performance over their first nine months in operation. Harsco has added an accessory of its own to 35 of the DP30N models, in the form of a box to hold scaffolding tools. Thanks to the fl at surface of the counterbalance weight, the container measuring 550 mm wide by 350 mm high by 250 mm deep rests neatly against it. Legs on the box drop into the two lifting eyes at the back of the forklift truck and are fastened with safety clips. Fitting the box requires no modifi cation of the truck itself but provides safe storage for items such as hammers and spanners that would otherwise have been loose in the operator compartment. Impact has provided all operators with induction training on the new forklift trucks, ensuring that each one holds the full relevant certification. When agreeing a new materials handling contract there is much more to consider than just the suitability of the forklift trucks. In Harsco’s case, the support services needed to include rapid, on-call, 24/7 support for all of its depots – as well as routine on-site servicing and maintenance. Impact was able to offer the services of 150 mobile engineers, with an average response time of less than two hours, to meet this need. Ian Sheppard confirms that the few callouts necessary to date have been answered with good response times and efficient repairs. Fleet management systems were another element of support that Harsco required. Supplied via Impact, they have been fitted to trucks at two of the company’s formwork sites to manage information on each truck’s uptime, location, collisions and other relevant factors. The company hopes that this approach will substantially reduce damages and increase safety. Last but not least, Impact has provided all operators with induction training on the new forklift trucks, ensuring that each one holds the full relevant certifi cation. Harsco has also appointed Impact as its preferred supplier for any additional forklift truck training required. Together, it seems that Harsco and Impact have presented a fi ne example of how a comprehensive materials handling solution should be created.